RYCO KNOW HOW can be delivered as a series of hosted training programmes to promote and develop safe working practices including the application of RYCO products. Training Sessions can include Hose Assembly Visual Evaluation - HAVE, Hose Assembly Lifespan Predictor - HALP®, Hose Assembly Training, Product Technical Manual Training. We even offer a nationally recognised course run in conjunction with The Kangan Institute –AURT309140A – Manufacture and Install Fluid Power Hose Assemblies. RYCO KNOW HOW also offers an online self-paced learning program. 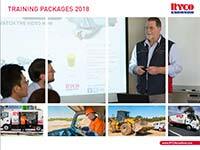 The program has been developed into a series of modules that will assist with developing a better understanding of the principles of hydraulic systems, system components and their application. RYCO provide on-site training to ensure that personnel are aware of their responsibilities and are competent in the use of our products. Training ensures that users have the confidence to select, assemble, and to safely apply our products. This Product Information Bulletin outlines the correct assembly procedure for RYCO JSEAL™ connections to ensure correct installation and that maximum performance is achieved. In addition to SAE J2593 (Recommendations on Proper Wrench and Torque Wrench Usage) and SAE J514 (Recommended Assembly Procedures) RYCO JSEAL™ assembly shall be performed as per the instructions in the PDF document.